What a week, as John Dane at International Yacht Collection tells me he's found a buyer for the 32.3m motor yacht Miz Doris III, listed by Talbot Freeman & Associates. Built by Westship in 1998, she was refitted in 2005 and 2010 and offers accommodation for 10 guests in a full beam master suite, VIP stateroom and a double and two twin cabins. 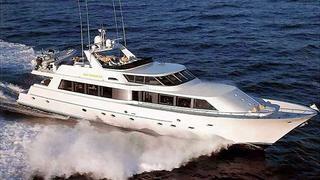 Miz Doris III was asking $2,449,000.